Business Day reported on Monday evening that Minister of Public Enterprises Pravin Gordhan unpacked the relationship between former president Jacob Zuma's son and VR Laser's bosses which led to bid to have the state owned arms company approve the Denel Asia and VR Laser Asia joint venture. Gordhan slammed former president Jacob Zuma's lawyer and former Denel chair Daniel Mantsha for criticism he dealt the minister publicly. Citing Gordhan's statement to the state capture commission of inquiry, chaired by Judge Raymond Zondo, Gordhan did not mince his words when defending himself against what he called public attacks on him from Mantsha. Given the fact that Mantsha once led Denel - a state owned entity that has fallen prey to management and governance failings now referred to as "state capture" - his role as the former president's lawyer is sure to raise eyebrows. Business Day reported that Gordhan raised a relationship between Salim Essa's VR Laser Asia and Duduzane Zuma's VR Laser SA in a joint venture aimed at "exploiting Denel’s intellectual property and proprietary information in India". In 2017, during his time as minister of finance, Malusi Gigaba said Denel’s decision to cut ties with VR Laser sends a message of the commitment by state-owned enterprises to good governance. By February 2016, the office of the Chief Procurement Officer wrote to Denel enquiring whether government requirements were complied with. Denel responded indicating it would provide the requested information. Business Day also reported on Monday morning that Zuma pushed for a R1trillion nuclear deal as far back in his presidency as 2011, a claim also contained in Gordhan's affidavit to the Zondo Commission. 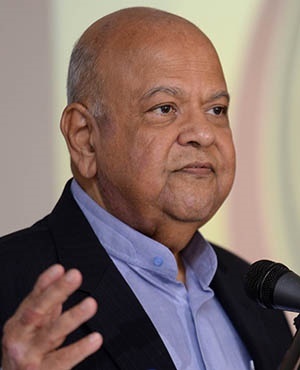 During this time Gordhan was minister of finance but was eventually moved from National Treasury twice - first after Zuma was re-elected in 2014, where he was made minister of cooperative governance and a second time when he was removed from Cabinet in a reshuffle in 2017.